It’s not always easy to spot mold colonies in your home. Very often they grow in dark, isolated areas that aren’t easily noticeable or accessible. That’s why many people experience symptoms of mold exposure without realizing the problem lies in their home. If you’re not familiar with these symptoms, it can be easy to mistake them for a persistent cold or other illness. If left unchecked, mold exposure can lead to more serious health issues in the future. Today we’ll look at a few of the most common signs that you’re living in a home with toxic mold. If you come home from work and suddenly suffer from itchy, red eyes and a runny nose, it could be because of a hidden mold colony in your home. 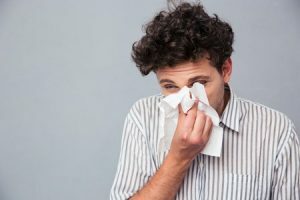 You should be especially wary if you don’t typically suffer from seasonal allergies, or if your symptoms only show when you’re at home. When you inhale mold spores, they can irritate your upper respiratory tract causing coughing, congestion and shortness of breath. These symptoms are often worse for people who have asthma or other respiratory conditions. That flu you just can’t seem to kick? It might not be the flu after all. Persistent, unexplained flu-like symptoms can be indicative of mold exposure too. These include fatigue, stiffness, joint pain and headache. In some cases, toxic mold exposure can trigger neurological symptoms as well. Memory problems, disorientation and vertigo have all been reported by people who’ve lived in homes with toxic mold. If you suffer from any or all of these symptoms and can’t seem to find out why, it could be because you’re living with toxic mold. Here at Jun’s, we can inspect your home for mold and perform a safe, effective mold remediation if necessary. Contact us today to receive your free estimate.